In Raman spectroscopy, it is essential to utilize a clean, narrow bandwidth laser due to the fact that the quality of the Raman peaks are directly affected by the sharpness and stability of the delivered light source. The i-Raman® spectrometer system features a patented CleanLaze® technology with a linewidth < 0.3nm when equipped with our 785nm laser. This technology results in the correct center wavelength and avoids the phenomenon of “mode hopping.” In addition, the laser output power can be adjusted in the software from 0 - 100%, allowing you to maximize the signal-to-noise ratio and minimize integration time. The center wavelength of the laser line is precisely maintained even when the peak power is increased by utilizing a series of high end filters. A laser line filter is used to clean up any side bands and ensure a narrow excitation is delivered to the sample by removing all secondary excitation lines before exciting the sample. The light collected from the sample is then filtered via a notch filter. Finally, an ultra steep long pass filter further removes lingering laser lines to allow accurate measurement of Raman peaks as close as 65 cm-1 from the Rayleigh line. The spectrometer design in the i-Raman® is dedicated for Raman applications. You can customize your spectrometer by choosing from a variety of excitation wavelengths. In addition, each configuration can be further customized for your individual detection needs. Choose from wider spectral range or high resolution optimized systems. Research grade spectral resolution of 3.5 cm-1 can be achieved with our double pass transmission optics. Most Raman applications do not require such tight resolution, so a wider spectral range would be the better choice in that case. The high-throughput optical layout of all i-Raman® configurations are ideal for those low-light level Raman applications. The probe allows for measurement of various materials in the form of liquids, gels, powders, or solids under both lab conditions (lab grade) or demanding environmental conditions (industrial grade). Constructed with state-of-the-art telecom packaging techniques, the probe has a flexible fiber coupling encased in a durable protective jacketing material. Wavelength excitation probes come in 532nm and 785nm. The i-Raman Pro is controlled using the touch-friendly onboard BWSpec® Mobile software or by connecting to an external PC operating with BWSpec®. The BWSpec Mobile intuitive acquisition and control software provides real-time prediction capabilities and identification functions which display results immediately after data is acquired. Multivariate quantitative models applied in real-time allow for process monitoring with options to display trended results in control charts. B&W Tek offers comprehensive software packages that provide solutions for Raman application needs. BWSpec® is the foundation for all B&W Tek software platforms and is provided with every Raman spectrometer. Our suite of software includes powerful calculations, easy data management, and user friendly, easy-to-follow work flow all at the tips of your fingers. Data can be readily exported from BWSpec Mobile for further analysis and model building in the BWIQ® chemometric software package. 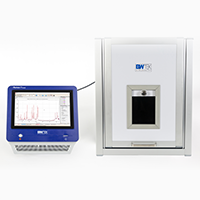 Built on the proven BWSpec platform, BWID®-Pharma software is a fully 21 CFR Part 11 compliant software designed for pharmaceutical manufacturing facilities that are facing the increasing need for 100% inspection of incoming raw materials, and nondestructive methods for final product testing and counterfeit detection. In addition to all the features provided in BWID®, BWID-Pharma provides enhanced system access security, secured data storage, and an audit trail of data activities. IQ and OQ services are available.